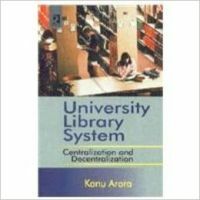 University Library System : Centralization and Decentralization is an effort by the author to offer suggestions for better coordination between central and departmental libraries in University library system. The book begins with an introduction of higher education and university library systems. Further it explores the problem of organization of centralized and decentralized libraries in universities. The university library systems of other countries and regions like UK, USA, Canada, Europe, and Russia are also discussed. Central to this research is a study of development cycle and present organization pattern of university library systems of Guru Nanak Dev University, Amritsar, Punjabi University, Patiala and Panjab University, Chandigarh. The variables and whole study were designed after doing an exhaustive pilot study. The major variables tested and studied in present research are space, basic facilities, infrastructural facilities, collection, library staff, services, budget, library coordination, automation, user surveys and user satisfaction. Teachers, students, library professionals and library in - charges were the active participants in this study. The data collected in universities under study is interpreted simultaneously. A set of guidelines for making action plan for the better coordination and to achieve optimum service levels in university library system is provided. If implemented properly it would help our university libraries to walk with international universities on same platform. Whether you are student of Library and Information Science studies, who wants to learn, or library professional or administrator desiring to have effective libraries rich in resources, University Library System : Centralization and Decentralization is an invaluable resource. Readers will come away with the foundation needed to learn about university and its libraries, design or redesign of libraries, a solid understanding of good library practices and a working library coordination application/model that can easily be expanded or customized. Readers will also learn how to make best use of their central and departmental libraries in their university.